This core statement of the current GEXSO study is also the conclusion of an article by the GEXSO partner LOGISTIK HEUTE titled “Technology as a catalyst” (cf. LOGISTIK HEUTE, issue 10/2014). Accordingly, technology change is experienced more strongly by companies that search for production sites and suppliers in different regions of the world. Nearly 72 per cent of the GEXSO study participants notice a strong technology change in their company in one form or another. Almost a third of these companies have revenues of more than EUR 1 billion. The strongest change is noticed in the usage of new materials and electronic components. These two areas are vastly affected by innovation and technological developments. At the same time, new production methods are most frequently mentioned as process technology-related innovation. In most cases, technological alterations are based on internal innovations. Partly, changes are also driven by customers. Government institutions and suppliers are rarely seen as drivers for general technological change. Companies most frequently stated that they have implemented a general strategy for the identification and research of new technologies as well as an open business culture in order to successfully implement technical innovations. On the contrary, flexible and fast decision-making procedures are seen as deficiencies. Sufficient budgets are also mentioned less frequently. 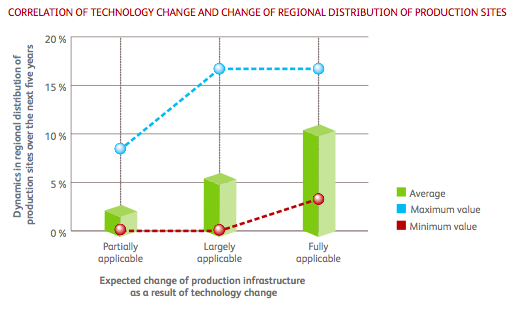 The primary effects of technological change are an adjusted production infrastructure and new suppliers. Moreover, supply chain processes are also adjusted to a great extent. Therefore, innovations in process and product technologies have direct impact on supply chains. In addition, companies that experience an exceptionally strong technology change, also globalize their supply chain to a greater extent. Thus, companies that notice a significant technology change, also expect a stronger shift in the global distribution of their production sites within the next five years. In general, most interviewed companies are subject to a significant globalization process; more than 60 per cent of the companies serve half of their customers outside their home region, Western Europe. While 37 per cent of the companies plan to increase the globalization degree of their production sites within the next five years, even 73 per cent plan to increase the share of global procurement volume. 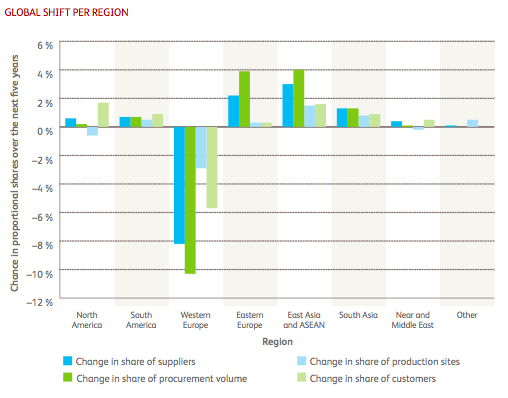 This so-called ‘global shift’ confirms Western Europe’s decreasing significance regarding customers, suppliers and production sites, as well as procurement volumes within the next five years. In particular East Asian countries will benefit from this trend, as well as Eastern European countries, but these mainly regarding procurement. This shift, as repeatedly examined by GEXSO, changes companies’ supply chain structures in the long-term. Due to increasing globalization degrees in procurement, there is a stronger focus on country analysis of potential procurement markets. Difficulties that participating companies experience most frequently in the procurement process are exchange rate fluctuations, high levels of corruption, and insufficient quality from suppliers. Russia and China, followed by India, are seen as the most difficult countries. In China, the protection of intellectual property is considered as particularly difficult. In Russia, general political conditions and high levels of corruption are seen as obstacles. According to the participants, sourcing in India is hindered by insufficient infrastructure and missing quality standards of employees and suppliers. The Eastern European countries of the EU, the USA and Turkey are regarded as highly attractive for procurement while only a few difficulties are experienced. Although China is seen as one of the most difficult procurement markets, participants also rate its attractiveness as exceptionally high, thereby attesting to China ́s high potential in the future. Companies that experience an exceptionally strong technology change also globalize their supply chain to a greater extent. If you want to read this executive summary offline or send it to colleagues, you can download it here.